“Healthy food healthy living” More and more people researching out for healthy, natural and nutritious diets. Walnut is the best for health. Walnuts provide healthy fats, fibre, protein, vitamins and minerals. Also the high in omega-3 fatty acids that increase your mind power. Tulsi is the greatest edible nuts and dry fruits brand in India. They provide a high-quality walnut to its customer. Its vacuum-packed box comes with a beautiful yellow colour. 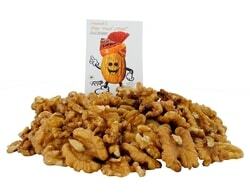 The premium flavoured nuts come with a capacity of 200 g. Its a totally cholesterol free product. This is an ISO 22000:2005 & HACCP certified company. Crispy and fresh walnuts from Kashmir. Maximum shelf life is 6 months. 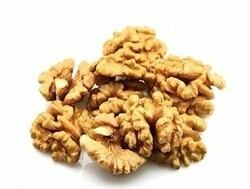 GO Organic Light Broken Walnuts produces by a group of Kashmir kernels. It provides 100 % natural gluten-free fresh product. The 1 kg capacity of walnuts comes in four different packing. The GO organic walnuts can be added in salads, stir-fried veggies, rice dishes, pulao and whatever you like. Its vacuum packed box keeping a walnut crispy and fresh. To store in a refrigerate and keep away from sunlight for time freshness. ANCY Natural Kashmiri Walnut has origin brand of India. The provides a high quality of product to buyers. This product gives us 12 months of shelf life as good compared to another product. Its natural walnut, no artificial flavour or sweetener are added. Its packed in a green colour airtight plastic wrapper. 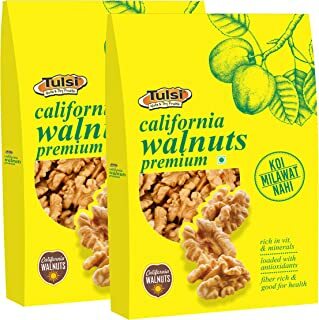 2 packs (each of 250 g) of walnuts. Carnival Premium Walnut comes with a rich and sweet flavour. These Walnuts come from the USA and manufacture with lots of love of the agricultural of USA. Carnival has selected premium quality walnut on the farm. This premium hand-picked walnut packed in an amazing box. Also, it packages them very hygienic precautions and neatly. Packed high quality selected walnut. Comes in a vacuum pack to retain freshness. Sainik’s Dry Fruit Mall walnut is a rich source of energy and the full of all the nutrients, minerals, antioxidants & vitamins. That all energy sources increases your memory and all function of the body. The provides superior quality of organic walnut with packed in a transparent pouch capacity of 500 g.
Maximum shelf life is 9 months. Tulsi walnut brand has produced the very best Nuts & Dry Fruit brand in India. It has covered the largest market that supplying to all the large superstore like Big Bazaar, Reliance, Birla, Wal-mart, Easyday, Spencers and many more. Mostly, exporting to its product more than 20 countries. 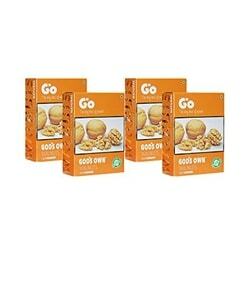 GO Organic Walnuts is produced by Kashmir walnut group. It is very famous for its quality. Go organic walnuts is significantly high in Omega-3 fatty acid that good for health. This brand is produced 100 % natural gluten-free fresh product. 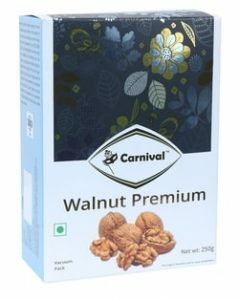 Carnival Premium Walnut is a product of Candor Food PVT.LTD. Its network spread in the wide range of area and the never compromise in quality. The used advanced technology in the dry fruit packing. Ancy Natural Kashmiri Walnut is the best brand in India. Its dedicated to providing high-quality products and premium service to the buyers. It’s a trustworthy product gives a maximum of 12 months of shelf life. Walnuts are loaded with natural goodness, it is the best way to include natural proteins, vitamins, good fat into your diet. 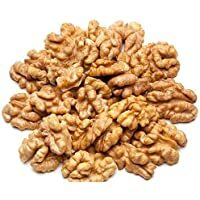 The fact is true that walnuts are high in natural fat and calories but the best part is, they are good for your health. If you take a reasonable portion, their unsaturated fats contribute to making you fit and healthy. The benefits of walnuts are endless: We try to explain more and more. Walnuts are full of omega-3 fatty acids that help in improving focus. Our observational studies advice if kids or adult strat eating walnuts that help in booster memory and aid in brain development hence very good for children. It has a high content of antioxidant properties which removes free radicles from the body and fight against certain types of cancer such as breast, prostate and colorectal. Our study announced eating nuts can lower cholesterol and reduces other unhealthy inflammation. Walnuts are rich in omega-3 fatty acid that has been shown to reduce heart disease. So eat a handful of walnuts daily. Walnuts make melatonin in our body. If you are eating before going to bed in regular then will help to good sleep every night. Also, you are take in your dinner dishes for restful sleep. Vitamin E presents in walnuts that balancing the texture of moisturisation and make your skin soft and smooth. It also nourishes your skin and helps to prevent wrinkles, dark circles and dryness. Reduce stress and Prevents blood pressure. A quarter cup of walnuts provides a high level of omega-3 fats when you regularly eat. This helps to relieve stress and maintain blood pressure level. Everybody knows walnuts contain includes a lot of nutrients and omega 3. Omega 3 fatty acids are improved baby’s brain activity so, pregnant mommies listen properly. Walnuts are playing important roll while you are pregnant. How to buy the best walnuts in India? Buying walnuts is not an easy task, always give high preference to the walnuts which are harvested in late August through November month. This is the best time to store and maintain the freshness of the walnuts. The walnuts must be bright brown in colour, always opt for the one which is uniform in size. Each walnut should be spherical in the shape, the size should be similar to regular lemon. The usual weight of each walnut is about 10-15 grams. The walnuts are well secured in a signal edible kernel, avoid buying walnuts which have cracks in it. Each walnut kernel contains two lobes, these are usually uneven in size. The inner layer is off white in color and it is covered well by the overall thin paper like brown colored skin. Avoid buying the walnuts which have spots and molds in it. It should not have any cracks. If you prefer to buy shelled walnuts, you can securely preserve them in airtight containers. It is advisable to place the walnuts in the refrigerator to improve the shelf life. If you want to buy unshelled walnuts, always keep them in a cool and dry place. It helps to store the walnuts for many months without any molds in it. Avoid buying rubbery, dark and shrunken walnuts. The nuts should not be tightly packed else getting the nuts out of shell will be too difficult. Avoid buying the walnuts if the shelf life has expired. It is safe to give a deadline of 6 months to the walnuts. Why Choose The Best Walnuts in India? Always looks for the trusted brands while buying walnuts, walnuts are loaded with vitamin E and omega 3 any acids. These components makes it the best plant-based nut which has excellent nutritional benefits. Walnut offers 654 kilocalories of energy and has 13.71 grams of carbohydrates in it. Many walnuts have the oil extracted from it, hence opt on the best walnut in India. Some people can be allergic to walnuts or similar nuts. In the case of allergies, there are high chances that an individual can experience vomiting, swollen lips, breathing issues, chest congestion as the common symptoms during walnuts allergies.